The Log Walk is a balance beam suspended over water by two tall poles. A small block lies in the center of the board that Cadets must step onto and then over. The first ladder leads Cadets from the ground up to the beam and the second directs them even higher to the Rope Drop. 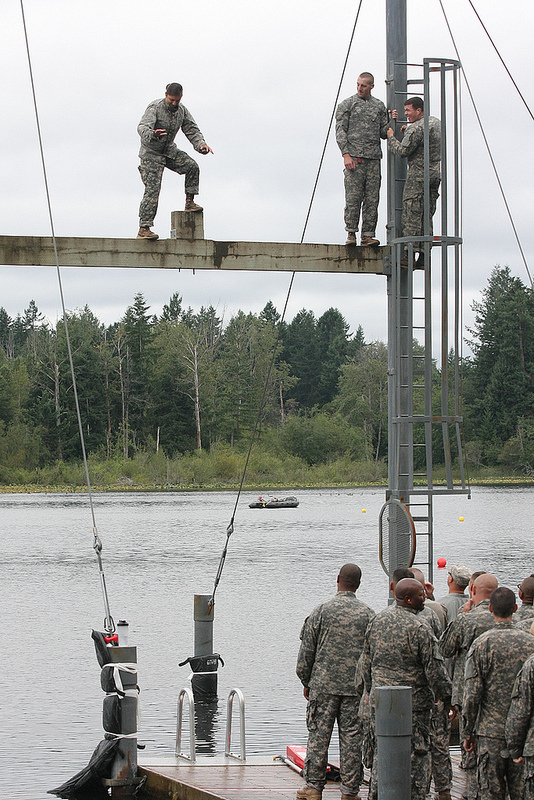 After shimmying to the middle of the horizontal rope, Cadets must hang from it long enough to state where they are from before letting go to fall into the water below. Cadets must pass this portion of the site in order to graduate. This was a challenge to Cadet Jennifer Anderson, who said she is afraid of both water and heights. “I was scared at first but since I’m not wearing my glasses, it made it easier to go across without actually seeing how far up I was,” Anderson said with a smile. The second portion of the site, called the Slide For Life, also involves water and altitude. Cadets hang from a pulley to descend down a zipline four stories high. This is often difficult for those with slick hands from the LogWalk/Rope Drop. Cadet Alex Marquez was most worried about losing his grip on the Slide For Life and opted to start with this activity. “Climbing up the ladder to that platform was the worst part, but it was easy once I stepped off,” Marquez said. The third challenge for Cadets at the water confidence course is the Zodiac Assault Course. For this event, Cadets work in teams of 9 to 13 people on a Zodiac assault raft and navigate obstacles through a timed course. Cadre who are licensed lifeguards wear bright white shirts and carefully watch Cadets from the moment they arrive to the time they walk soaking wet onto shore. They are available in case any emergency arises, such as an unprepared Cadet losing their footing or a life vest making it difficult to get back on dry land. Retired Command Sgt. Maj. Gary Fortunato is another cadre member who oversees the water confidence course and said safety is at the forefront of this exercise. Cadets walk onto the parade field for graduation only after overcoming their fears of water and heights.